A Gallup poll found that the number working Americans expecting to retire at 65 or older has risen from 44% to 61% over the last 15 years, while the number predicting retirement before 65 has fallen from 50% to 29%. The reasons may be related to shifting views on the rewards of working, as well as on the shrinking value of investments. 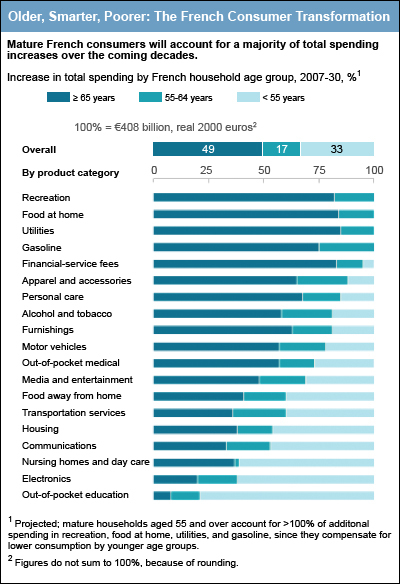 The Harvard Business Review’s Daily Stat republished information from the McKinsey Quarterly about how people over age 55 will drive two thirds of all growth in consumer spending in France over the next 20 years. These findings can offer implications for other developed countries. Consumers do respond differently to different types of media. While most of us still prefer direct mail, older consumers prefer it even more. The United Postal Service (USPS) will increase prices on January 2, 2011. The most noticeable will be the increase in the price of a first class stamp from $0.44 to $0.46. The post office is doing many things to help. They are releasing some new forever stamps in October. The stamps, featuring evergreen trees, can be purchased for $0.44 and used “forever” to mail first class letters. Prices for Standard Mail and Periodicals will also go up about 5.6%. Knowing the facts in advance can help in planning for end of the year advertising and direct mail. Waste, Signal of Economic Growth? The Harvard Business Review highlighted a story from Bloomberg about the number of US rail cars filled with waste as an indicator of economic growth. The stories stated that the number of cars jumped to 79,044 in April and May 2010, an increase of 45% from a year earlier, according to the Association of American Railroads. That’s the biggest such increase since at least 1994. The cargo consisted of iron and steel (42%), municipal waste and demolition products (32%), paper (11%), ashes (5%), nonferrous metals (4%), miscellaneous (4%), and chemical waste (1%). This is an unusual statistic and source of optimism about the economy, but something that has not gone up since 1994 got our attention. According to an extract by Harvard Business Publishing of a snapshot of Economic Conditions, by McKinsey Global, 69% of a global panel of executives surveyed during the second week of December 2009 said they expected their national economies to be at least moderately better by the end of the first half of 2010. In fact, 24% said that an upturn has already begun. A majority of executives expect consumer demand for their goods to rise in the near term. Respondents offer relatively positive views of the economy and say they can now make longer-term strategic plans. Just over half of executives continue to say economic conditions are now better than they were in September 2008. According to an article extracted from a November 2009 McKinsey Quarterly by Harvard Business Publishing, executives are becoming more optimistic about the economy and the strength of the recovery. In the survey conducted during the last week of October 2009 that measured executive mood, 51% said they think the economy is better now than it was in September 2008. Many people are hurting and according to most experts it is going to take a long time for the employment rate to pick back up. However, just as it took a very long time for people to admit that our economy was not good, things may be better than we think. In October of 2008 I looked at what was happening in the economy and tried to understand what many people were saying and why they said it. I looked at a history of recessions in the U. S. since the early 1900’s. Today I looked at the economy from the other perspective, focusing on the periods of growth and prosperity; believing that the glass is half full, not half empty. I found details about the US Gross Domestic Growth Rate (GDP) going back to 1947. A negative GDP for two or more quarters is what defines a recession. What about your strategy right now? This is a great time to start cultivating new prospects. Get your name, your products, your solutions in your customers minds so that when they are ready to buy, you will come up on the short list. Think about sending mail. Should you alter your marketing plan to prepare for the upturn?